As soon as my husband and I made the decision to go to Hawaii for our first trip last year, the first thing I told my husband was that we needed to do a luau. My husband was a bit resistant, but that was because he felt like it was so touristy. Sure, it is touristy. But we’re tourists. You’ve just got to do it. It turns out that our hotel actually hosts a luau on the grounds each week, so booked tickets well in advance of our trip. As soon as we landed in Hawaii last year, when my husband turned on his cell phone, he had a voicemail from the production company that puts on the luau informing us that the luau we had tickets for had been cancelled. I was so bummed as we didn’t have any time left in our schedule to try to book another luau on another day. So, when we made plans this year to go back to Hawaii, I once again told my husband that I wanted to do a luau. What if this was my last chance? Instead of booking tickets in advance, we decided to wait until we arrived at the hotel to find out if the luau was going to move forward before we booked tickets to the luau. Seems as though luck was on our side as the hotel confirmed that the luau was indeed set to go on as scheduled during our stay. However, due to weather concerns, as it was raining most of the morning and afternoon of the luau, when we arrived for the luau, we were told that the decision had been made to move the luau indoors due to the potential threat of more rain. After all, the production company wasn’t about to have hundreds of people, as well as their musicians and dancers standing out in the rain for hours. This was a bit of a bummer, especially to myself and my husband, but hey, Mother Nature is beyond our control and we just have to roll with the punches. While an indoor luau isn’t traditional, once the festivities started, we didn’t even notice, or mind being indoors. Haleo Luau, or the Voice of Life, is the story of the history of the Island of Hawai’i, all of the Hawaiian Islands, and of Polynesia. 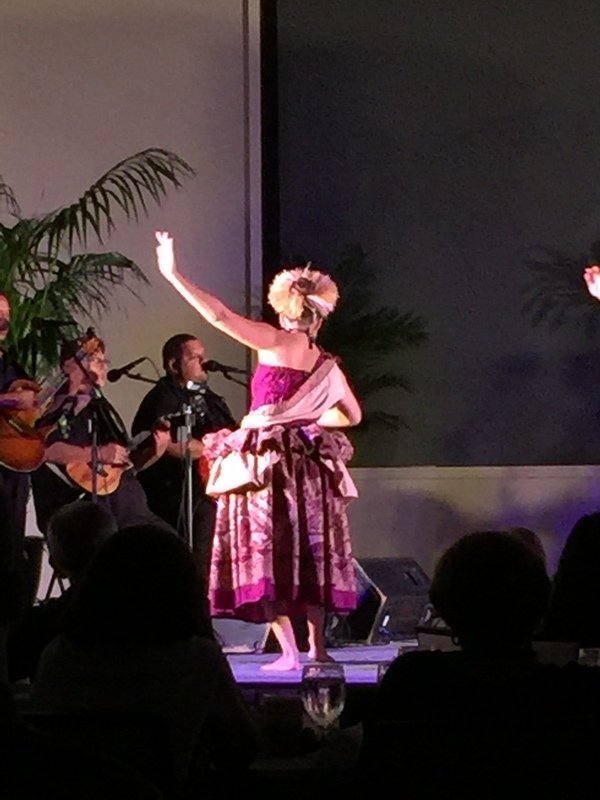 As we learn the story of King Kamehameha III, who was born not too far from Keauhou Bay where the hotel is located, we are shown through story and dance the history and culture of the Polynesian people with traditional Hawaiian hula, Tahitian dance, New Zealand dance and more. 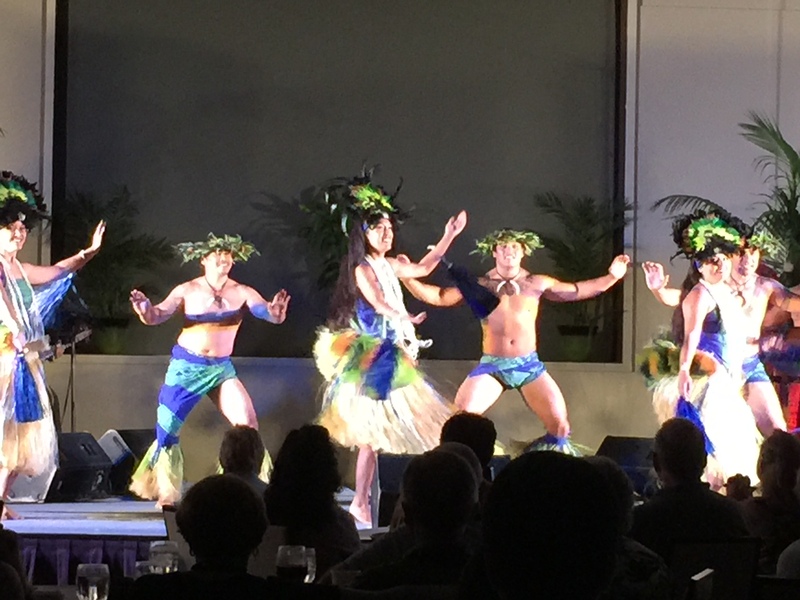 Now, when you attend a luau in Hawaii, it typically includes dinner and the show. 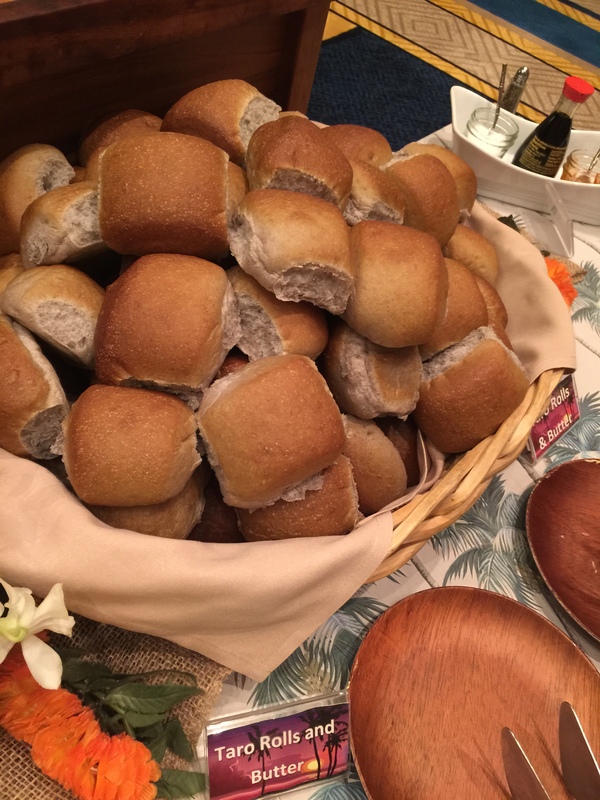 Most people know that you’re not going to a luau for the food, because, let’s face it, its mass-cooked, buffet-style, traditional Hawaiian food that sometimes even Hawaiians don’t dine on. But it’s part of the experience. So, everyone in our party went in thinking, let’s just enjoy the show, and the food, well, we’ll eat what we can. 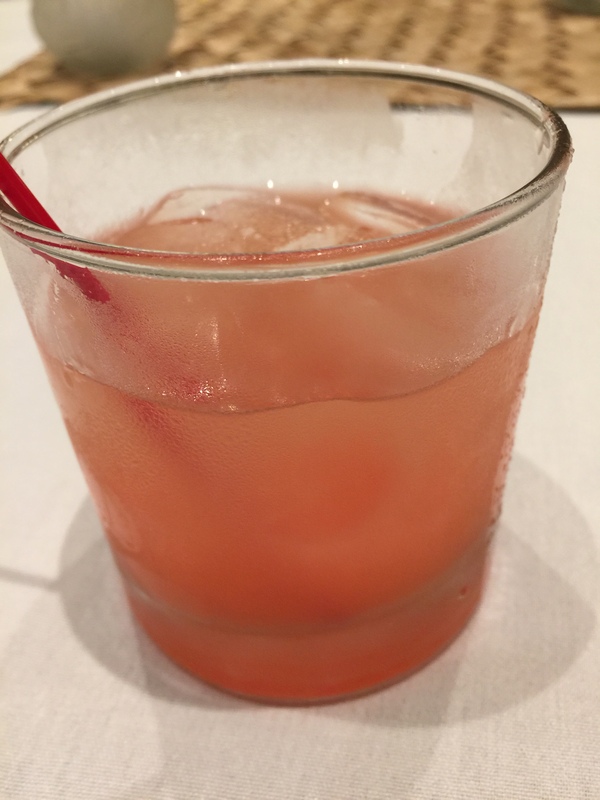 As we all walked into the convention hall where the luau was moved to, we were each handed a drink: either a Mai Tai for those wanting an alcoholic drink, or fruit punch for kids or those who didn’t want an alcoholic drink. Everyone agreed that the Mai Tai wasn’t too tasty and a bit watered down. However, the luau also featured an open bar which featured beer on tap, a couple of types of bottled beer, red and white wine and soda and juice. 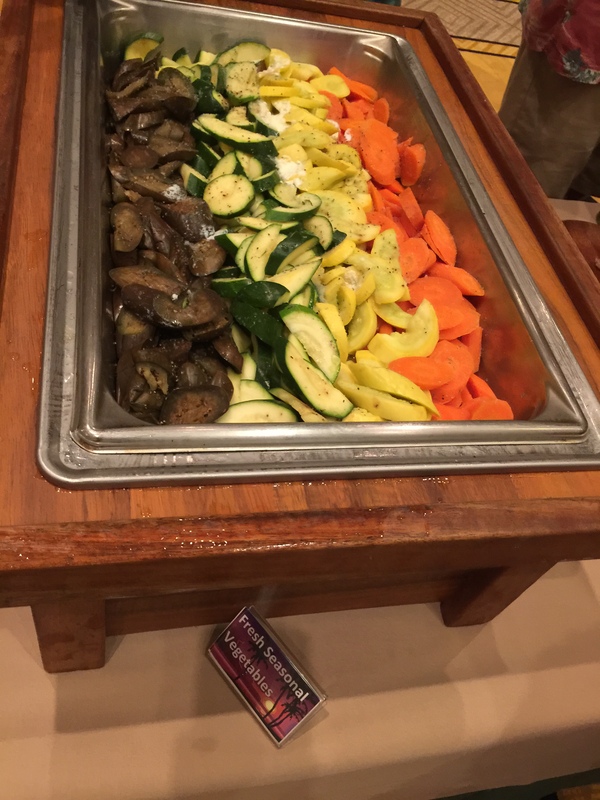 The food for the luau was laid buffet-style for people to line up and pick and choose what they wanted to dine on. The food was all-you-can-eat, so you could go back for more food as you wished. For some people, this was their first opportunity to really have a chance to try some of the traditional Hawaiian food. 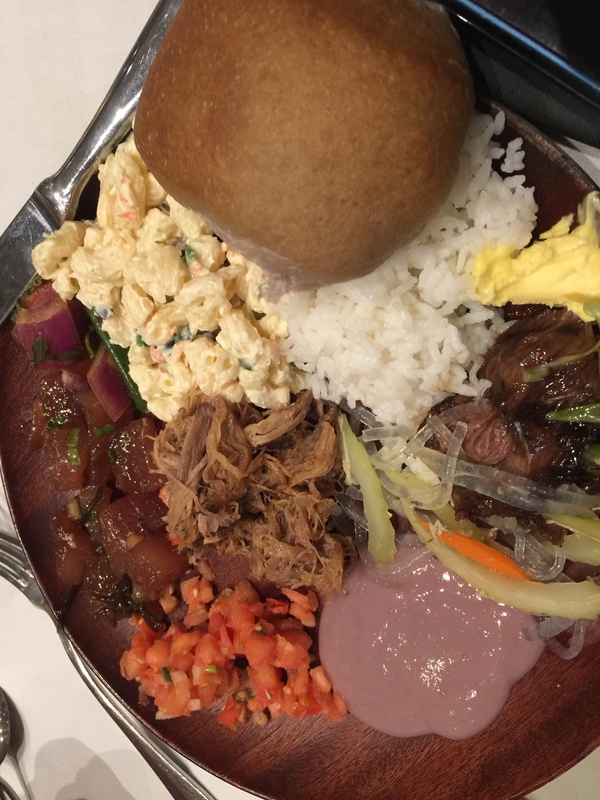 My husband was one of those people determined to try a little bit of everything that was offered, including the love-it-or-hate-it poi. First up, the salads and appetizers. Waimea field greens from the Big Island, tossed with sliced cucumbers and grape tomatoes along with your choice of either papaya seed dressing or balsamic vinaigrette. I’m generally not a fan of papaya, but I figured, hey, when at a luau, let’s give the papaya seed dressing a try, something I’d normally not choose. And I have to say, I was a fan. It was a little sweet, a little fruity and really good as a salad dressing. Maybe I need to revise my feelings on the fruit itself. Appetizers included a bunch of traditional Hawaiian specialities, foods that you automatically associate as being Hawaiian food. First up was the purple-pasty looking poi. 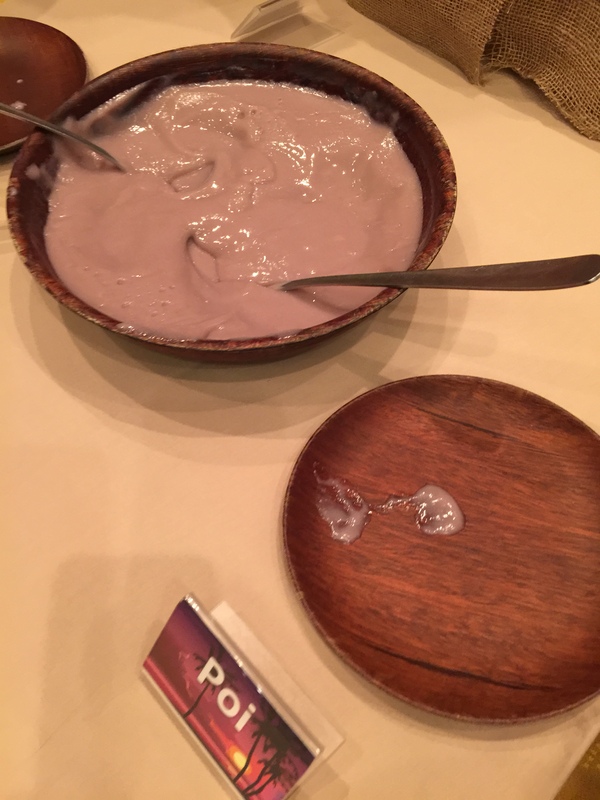 Made by mashing cooked taro, which is a root vegetable like a potato, and combining it with a little bit of water in order to create a paste-like consistency, this is a Polynesian, and especially Hawaiian, delicacy that people either enjoy or absolutely hate. I think my husband was the only one of the 6 of us to give poi a try. Ultimately, for my husband, he thought that the poi was nothing too special. It was there, so he gave it a try. He’d probably not order it on its own, but he also didn’t hate it. 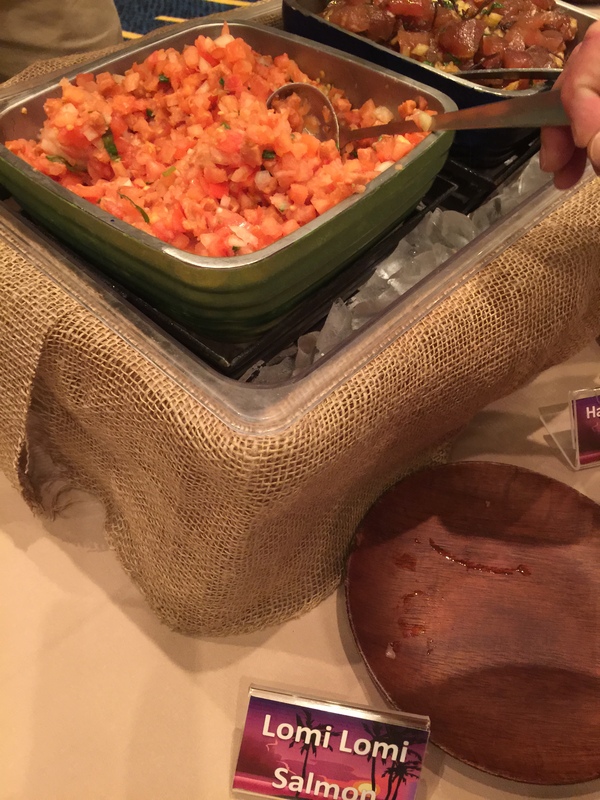 The other appetizers were a lomi lomi salmon, which is a diced tomato and raw, salted salmon salad mixed with sweet Maui onions. 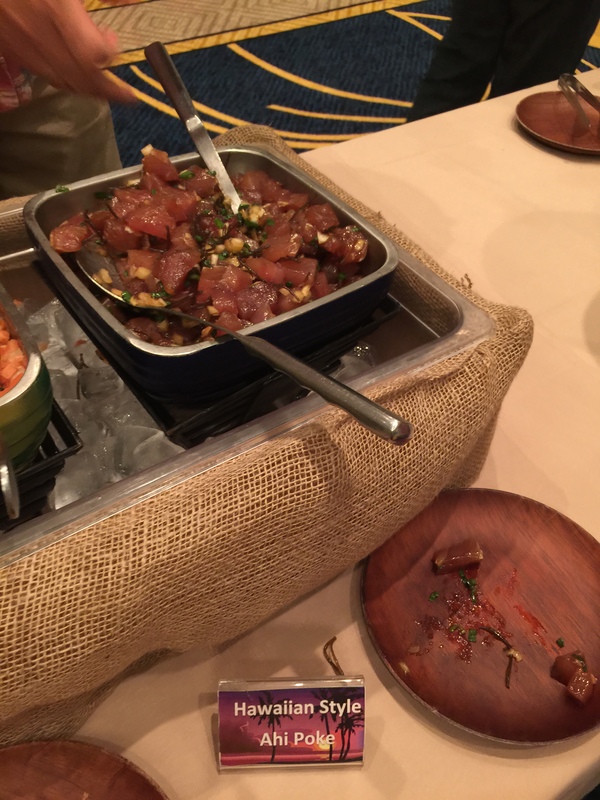 Lastly, there was also the Hawaiian style ahi poke. As a lover of poke, I was really excited about this dish. 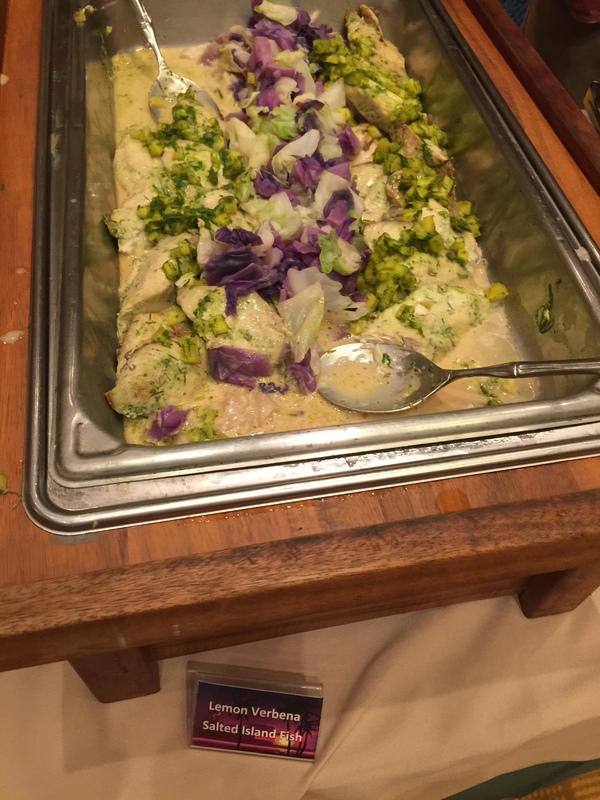 However, of all the dishes I tried during the luau, this was the dish I liked the least and was the most disappointed by. The poke was way too salty, it was like trying to swallow down a spoonful of salt with each bite. I just couldn’t handle it, and that was disappointing. 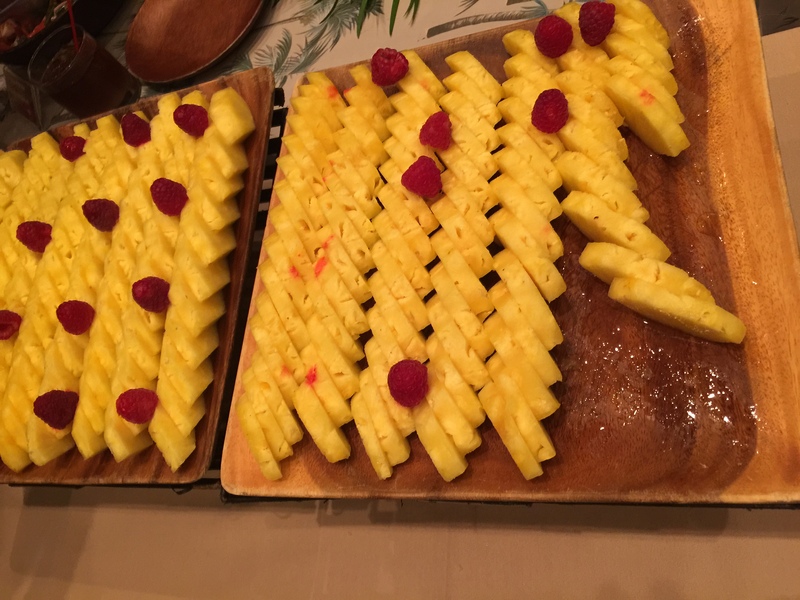 There was also a tray of fresh fruit that consisted of sliced pineapple and raspberries. I know that guava, mango, bananas and passion fruit are also tropical fruits associated with Hawaii, but pineapple is probably the most recognized Hawaiian fruit, and the easiest to serve to a large group of people. 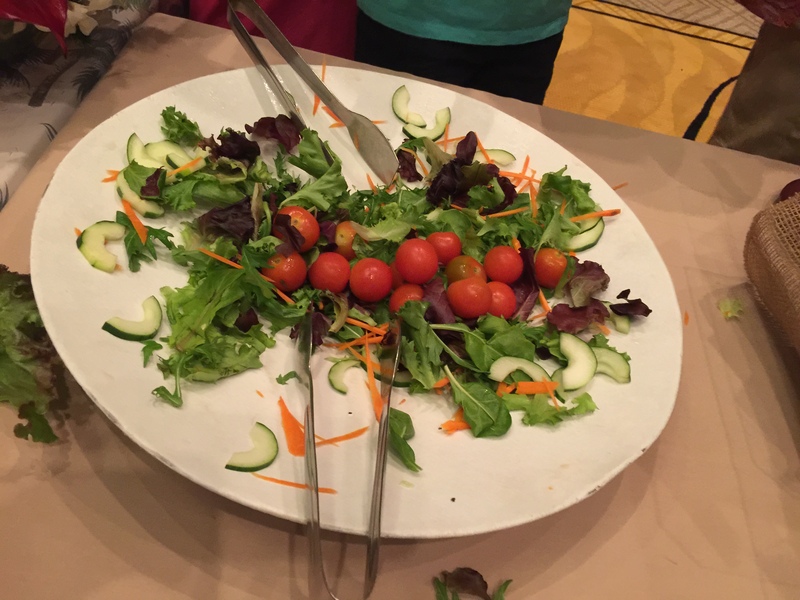 Finally, there was a selection of various prepared salads. 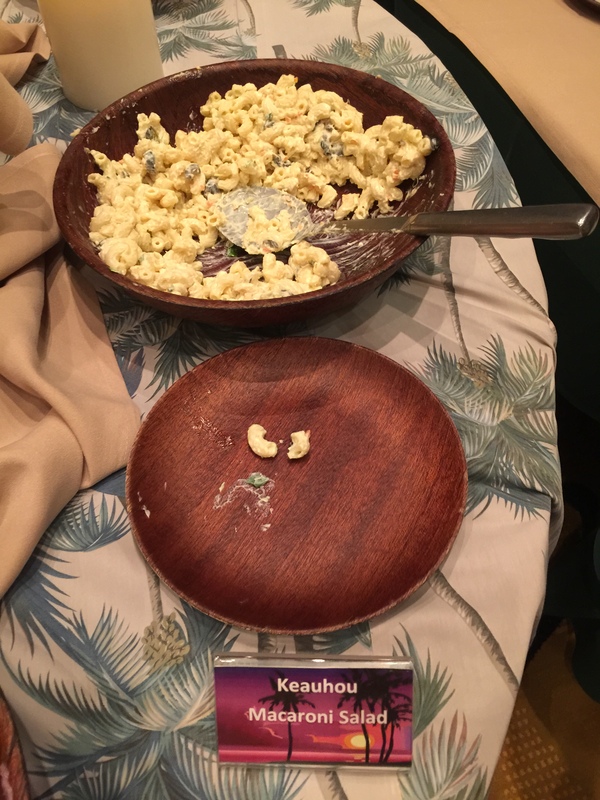 If you know anything about Hawaiian food, you know that they love their macaroni salad, so a luau wouldn’t be complete without the traditional macaroni salad, or in this case, Keauhou macaroni salad. 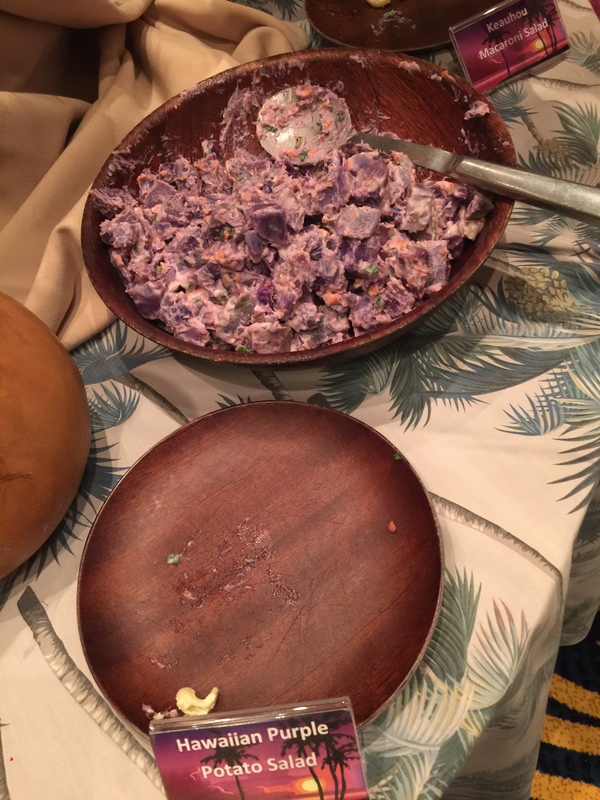 Hawaiians also have an affinity to potato salad, and Hawaiian purple potato salad is often served at large gatherings. The use of the purple potato makes it just that little bit different from your traditional potato salad. 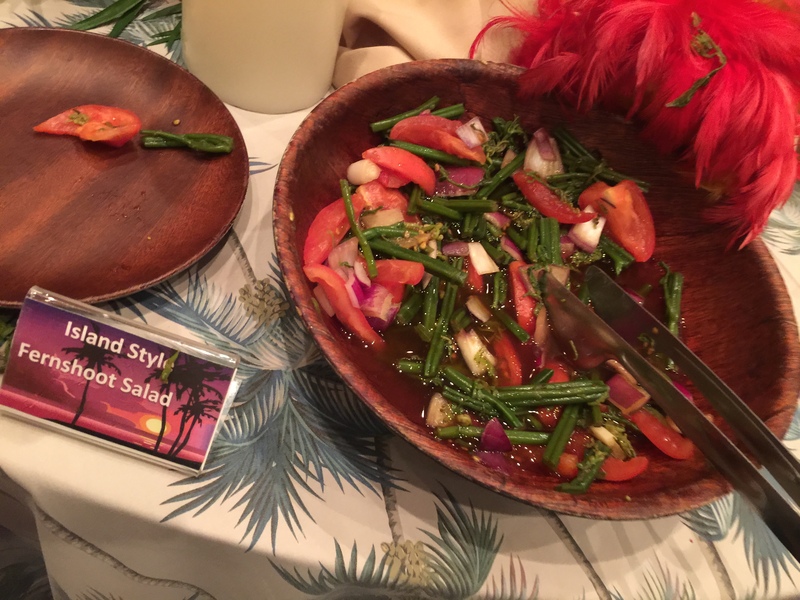 And finally, there was the island-style fernshoot salad with tomatoes and onions. I know that both my sister-in-law and mother-in-law tried this dish and while neither knew what a fernshoot was, they both loved the flavors of this salad. For entrees, we were given a pork dish, a beef dish and a fish dish. 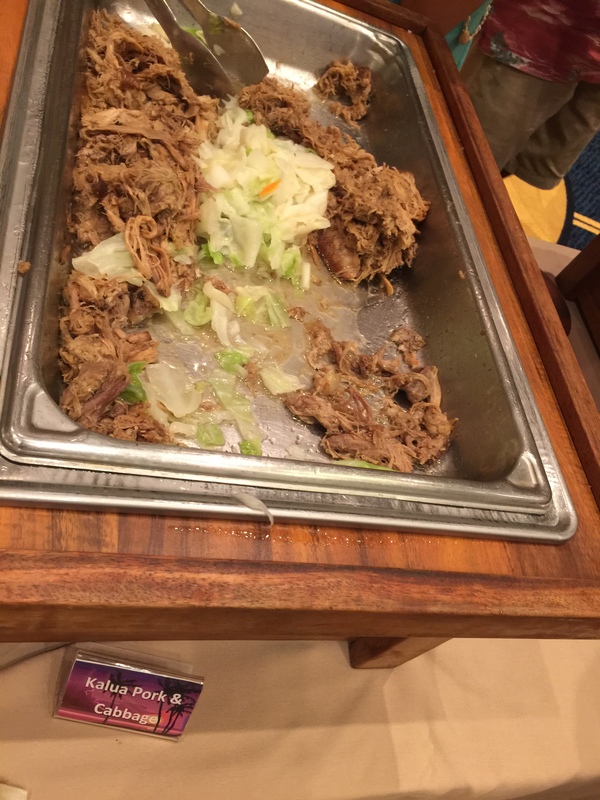 The pork dish was your traditional “imu pit” prepared pork. You traditionally see this dish prepared for luaus where a whole pig is wrapped in tea leaves or banana leaves and roasted in a specially prepared underground oven. 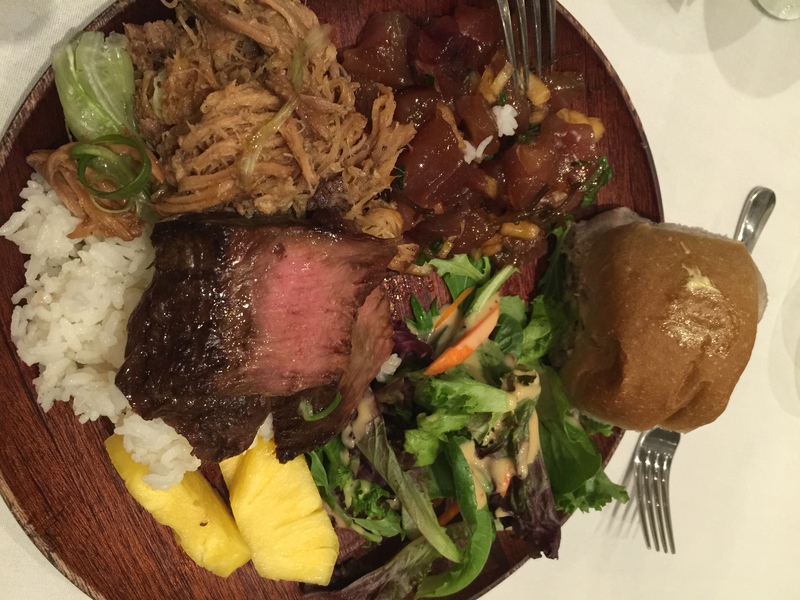 The Keawe smoked pork is then pulled out of its oven hours later and the meat is tender and fall-off-the-bone. I loved the pork, it was perfectly salted and flavored and incredibly tender. Lemon verbena salted island fish was the fish offering for the night. And finally, pineapple-soy glazed beef was our beef choice. 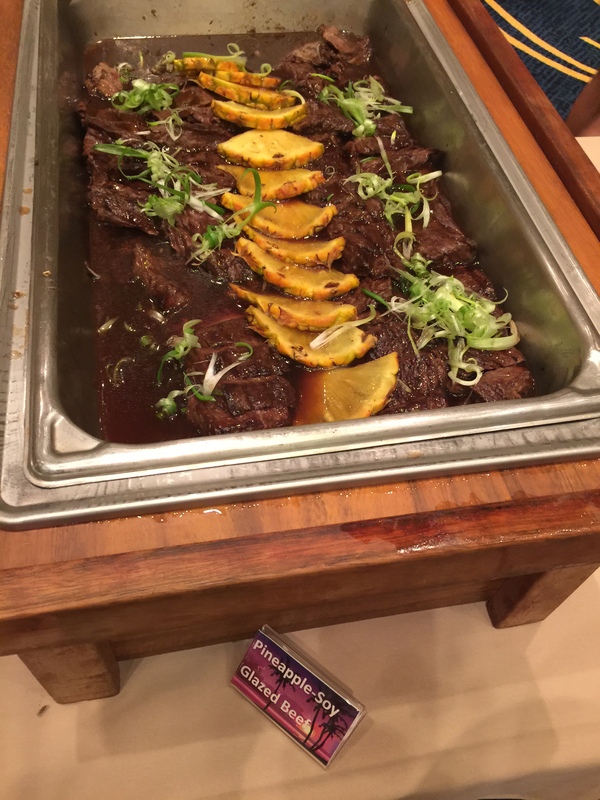 Personally, I liked the beef, I thought it was tender and the bit of salty soy and the tang of the citrus pineapple was terrific. I know that my mother-in-law wasn’t a fan of the beef at all. As side accompaniments, we had a choice of lemongrass-scented rice, grilled assortment of vegetables, taro rolls and mango butter and chicken and long rice. 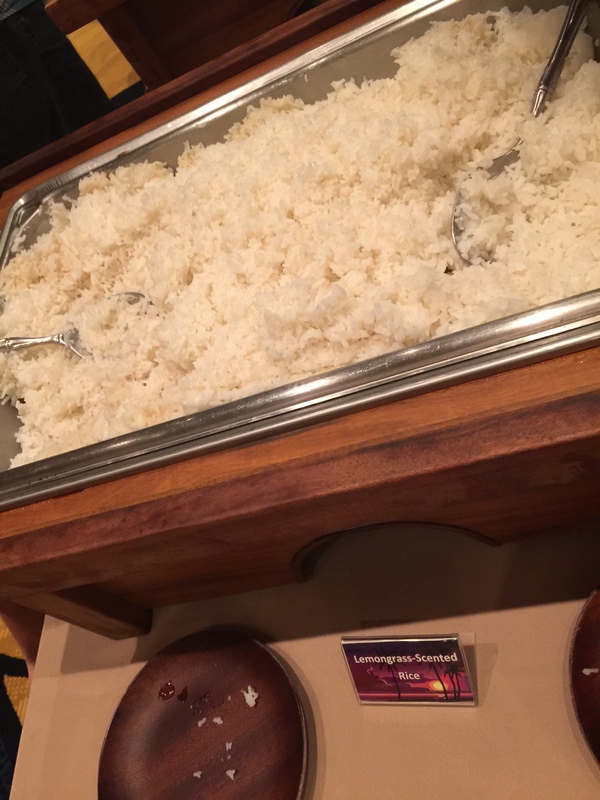 Personally, while I liked the rice fine, I found the description of lemongrass-scented rice a bit of a misnomer. Neither did I smell or taste lemongrass in my rice. And while the taro rolls certainly were purple-tinted like they were made with a taro puree, it also just tasted like a normal dinner roll to me. I didn’t try any of the chicken and long rice, but I know that both my husband and mother-in-law who were adventurous enough to give it a try both loved it. In fact, my mother-in-law thought it was the best thing she ate during the luau. With plates piled with food, we all got down to the business of eating dinner before the show started. Surprisingly, pretty much everyone cleaned off their dinner plates. I don’t think any of us went into this meal with high expectations, but we were all pleasantly surprised by the quality and taste of the food that was prepared. And of course, what’s an all-you-can-eat meal without the dessert? 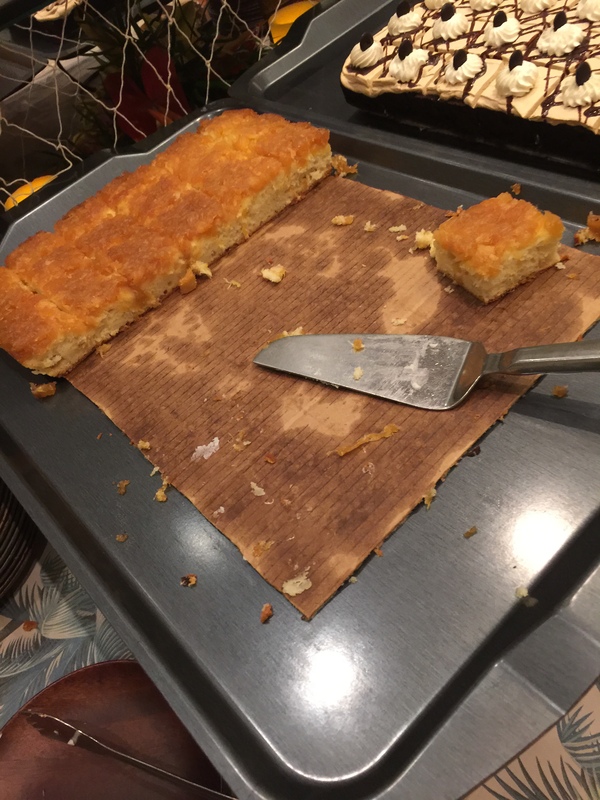 We were supplied with pineapple upside-down cake and Kona coffee chocolate cake. 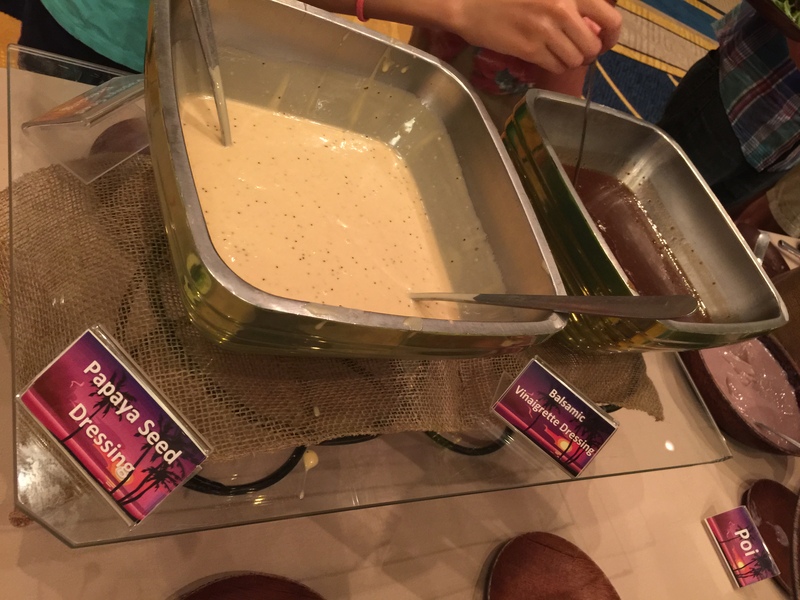 Those were the two most popular dessert items, probably because they were the best known dessert offerings. 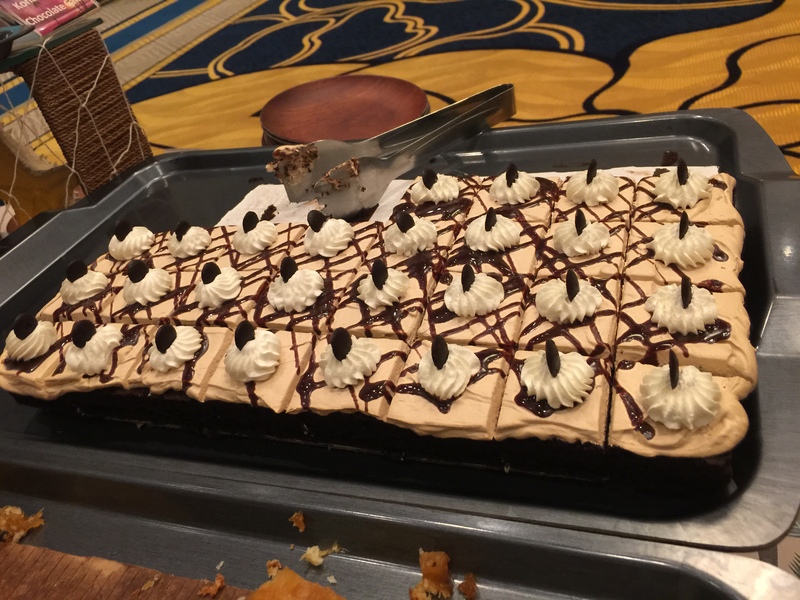 I actually enjoyed the Kona coffee chocolate cake, it had a great subtle coffee flavor and the chocolate cake was nice and moist. 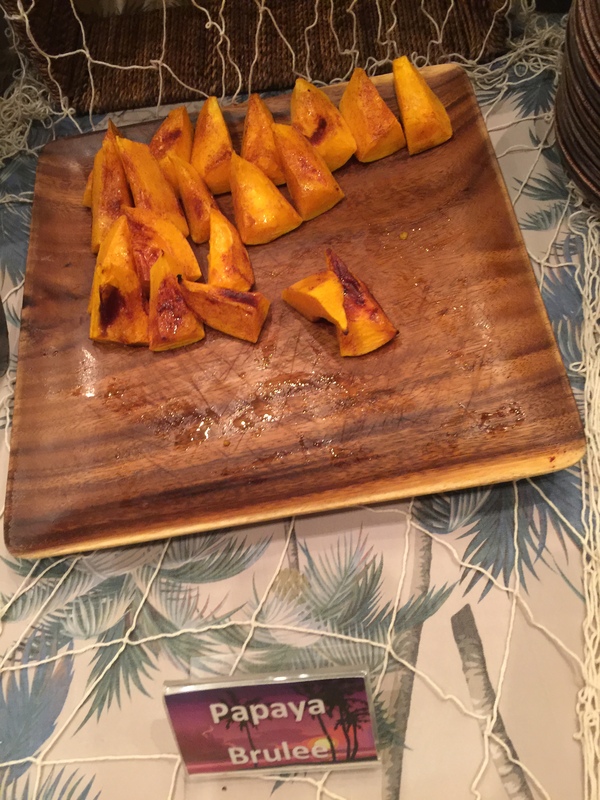 The other two dessert choices included haupia and papaya brulee. The papaya brulee was just wedges of fresh papaya topped with sugar and then torched to form a brulee-style crusted sugar top. I’d imagine that was a pretty delicious dish. 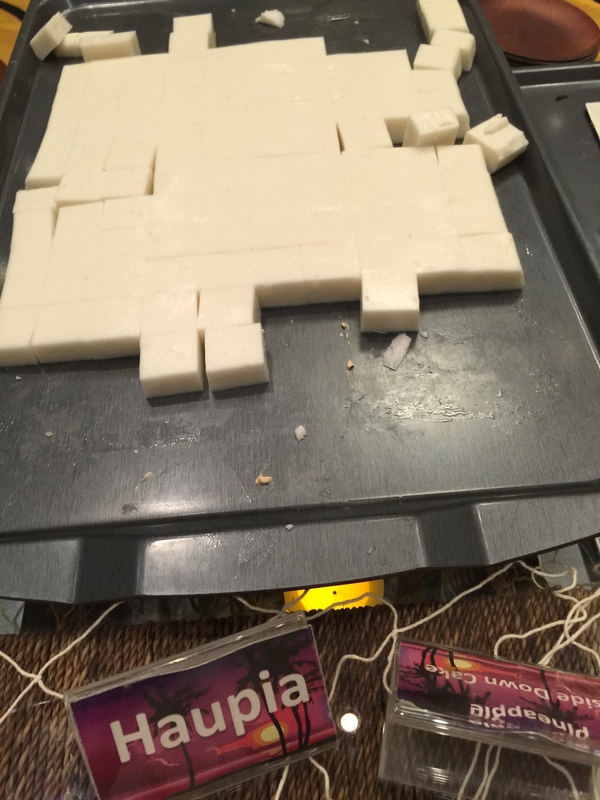 Finally, haupia is a traditional Hawaiian coconut-milk based dessert. Here, they turned the haupia into a jelly-like form almost like almond jello. But it can also be more of a frosting-like consistency for cake topping. And of course, what is dessert without an offering of coffee and tea? Kona coffee, of course. I think that by the end of the, we all had enjoyed ourselves more than we had expected to. I know my husband was bummed when we found out that due to rain the luau had been moved from an outdoor, ocean front location, to inside a grand ballroom. However, after the initial disappointment, it was fine. I was just relieved that after all this time, we were getting to be part of a luau. Something I could now cross off of my list. My husband was coming along for the ride because I forced him to. My mother-in-law was quite interested in attending a luau too, but everyone else in the family I think also came along just because it was supposed to be a family outing. In the end, the food was much tastier than we had all anticipated it to be, and that was a huge positive. And the show was more entertaining and enjoyable than all of us had expected, especially the finale with the fire knife dancer. I guess not everything that is super touristy is a bad thing, some things have a way of turning out much better than you expected them to. I thought this luau was really fun and I’m so glad we did it. It was nice that we were able to choose the foods we wanted to try, and we all found something we liked. My mom still talks about that long grain rice thing she had! It was just a fun outing and my whole family enjoyed ourselves. 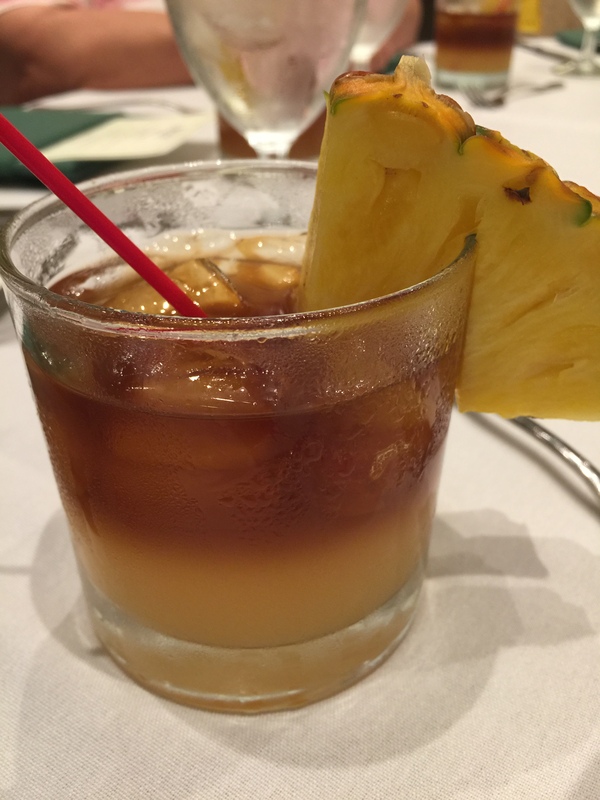 Our only disappointments were that it was inside, which like you said didn’t really matter after awhile because we kind of forgot, and the Mai Tais – which I guess is a case of live and learn – and my family learned that except for Greg, we don’t care for Mai Tais!